It's hard to imagine that the Undercity (below Lordaeron) and Teldrassil as we know them have been ransacked. Having played World of Warcraft since its beta I've created many additional characters (alts) in both locations, and witnessing the destruction of their home cities 14 years later is a sight to behold. So far Battle for Azeroth has proven to be a divisive expansion in terms of its lore choices, but based on the lead-in events it has a lot of potential to elevate itself above the tired "Horde vs. Alliance" conflict. Just last week Sylvanas led the Horde into the Alliance territory of Teldrassil and burned down its world tree. 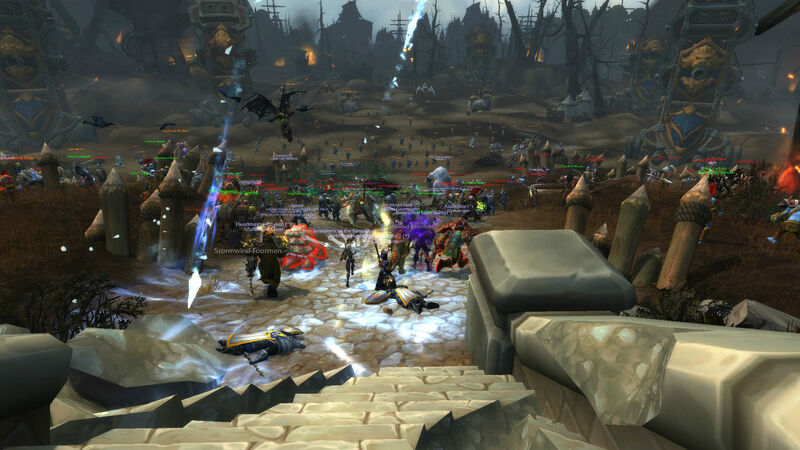 It was a magnetic event that shook the community, and the Alliance, led by boy king Anduin, are clapping back by retaking Lordaeron, a once great kingdom that is now ruled below by the undead as the Undercity. Upon loading up with my Blood Elf Demon Hunter (I started off as Horde in 2004, then swapped to Alliance a few years later, now I'm back to Horde from Legion on -- thank you for listening) I was summoned by Sylvanas to appear in Orgrimmar and queued up in a 20-person instance for the skirmish. You'll start with securing lower rung of Undercity from SI:7 and some undercover Alliance agents, then you're swept to the main open battlefield of Lordaeron for a good old fashioned slugfest with hundreds of troops. It's not a full-on raid or even a dungeon, more like a guided in-person tour of an event that would normally unfold through a cutscene (there are a few of those though as well as some surprises). At the end of it all Lordaeron falls and the Horde turns tail and runs back to Orgrimmar. For now all you can do is stare at the next quest giver until the expansion officially arrives next week. All-in with cutscenes you can expect it to take around 20 minutes, and if you don't get the quest immediately after logging in, wait a minute or so and it'll pop into your log automatically. If this is a taste of what's to come I can dig it. We get some pretty great major character interactions out of the quest (with fully voice acting), and it reminded me of the best parts of various expansions -- it really feels like a worldly event with actual consequences. One thing to note: this whole affair isn't fully permanent. You can go back to the Undercity and talk to a time drake to visit it previous time period if you want. Plus, the changes don't take place until you've actually finished the questline, so if you're logging in for the first time in ages you won't be greeted with desolation and dead quest-givers. The decision to make the Undercity (and by proxy, Teldarassil) still available is bound to be a contentious choice as Blizzard isn't truly committing to the lore portions of the battle, instead going with a gamey exception. If all of the NPCs were moved into a smaller Undercity somewhere else it would feel that much more poignant. Aside from an abrupt end I felt like the scenario did a good job of setting the stage for Battle for Azeroth. Stay tuned for our review in progress of the full expansion next week as I work my way toward the new level cap and the full assessment.